Water in your basement? Basement flooding? Leaky Foundation Walls? High radon levels? Call MidAmerica - we can help! We have designed effective solutions for drying wet basements, fixing wet crawl spaces, and restoring structural integrity to your home. MidAmerica Basement Systems is your premier locally owned and operated company that specializes in foundation repair, basement waterproofing, crawl space repair, cracked concrete repair, concrete leveling, concrete sealing, and radon testing or mitigation. 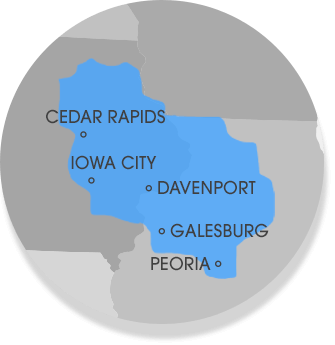 We have served homeowners and businesses in Peoria, Cedar Rapids, Davenport, Waterloo and throughout Western Illinois and Eastern Iowa. Quickly & effectively repair your sinking, cracked concrete! We specialize in reducing radon problems within your home! Design the extra room you need in a finished basement! For over thirty years, thousands of IL and IA homeowners & businesses have chosen MidAmerica Basement Systems because of our dedication to quality work and customer service. We are the exclusive installer of 30+ patented and warranted basement waterproofing & foundation repair products. The products are installed by our servicemen who are specially trained at the Basement Systems, Inc. headquarters and adhere to the highest standards of professionalism and expertise. You can expect us to arrive on time, to treat your home with respect and to provide answers to all your questions. It is our commitment to quality and customer service that recently earned MidAmerica Basement Systems the honor of receiving the BBB Torch Award for Business Integrity. "The crew were very polite explained everything they were..."
MidAmerica Basement Systems is a family owned and operated company with hundreds of satisfied customers. Our business has grown on customer referrals and we are proud of that. We have serviced both commercial business and individual homeowners in the Quad Cities, Cedar Rapids, Peoria, Waterloo, Davenport and all nearby cities.